Clarets boss Sean Dyche admits Saturday’s home clash with Brighton is “a really big game for us”. Burnley are winless in eight games, losing six of the last seven, but delivered a much-improved performance in the 3-1 defeat against Liverpool at Turf Moor on Wednesday night. That left Dyche’s side 19th in the table, level on points with bottom side Fulham, and he is looking for his players to use the display against the unbeaten Reds to build on. The intensity of the pressing was back, the desire and will to win, and Dyche wants more of the same against the Seagulls. Asked where that type of performance had been all season, Dyche answered: “We’ve been in and out of it, but we were very good at Southampton, very good here first half against Watford, very good here against Bournemouth – there’s been pockets of it, but now it’s about the consistency. “I’ve been speaking about it the last few weeks, and we’ve got to take that into Saturday. “Saturday is a big game – they are all big games, but Saturday is a really big game for us. “We need that mentality from the team and the crowd, because it’s a different kind of crowd against the big guns. 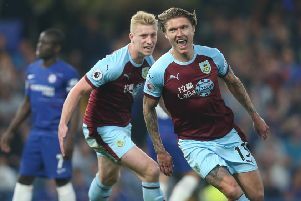 Dyche had said after Saturday’s hugely disappointing defeat at Crystal Palace that the underdog tag was returning, after smashing al expectations last season and finishing seventh to earn a Europa League berth. And he added: “I thought the team responded to that (underdog tag) and the crowd, it is back to that – we’ve been written off so many times since I’ve been here, and I think we had a look outside that world last season, and now we are back to that. “We are underdogs again, I’m not saying it for effect, we just are – people saying after the run we’ve had, the season we’ve had, they’re writing us off, ‘they couldn’t do this, they couldn’t do that’. “So it’s a fact, it’s not something I wanted, you want to go on and be recognised – and we have – but we need to use this to our advantage, and I think we did (on Wednesday). Burnley will check on midfielder Steven Defour, who missed Wednesday’s game as a precaution, six games into a comeback from his knee problems. Brighton will be without former Clarets loan man Shane Duffy, after the centre back was sent off for a headbutt on Patrick van Aanholt in Tuesday night’s 3-1 win at home to Crystal Palace.